Danny Hultzen – LHP – UVA. 7IP 7H 2ER 0BB 10K. 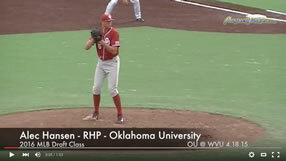 Casey Harman – LHP – CLEM. 7.2IP 10H 6ER 1BB 9K. Deck McGuire – RHP – GT. 7IP 7H 6ER 1BB 8K. Has looked very pedestrian over the past few starts. Justin Wright – LHP – VATECH. 6.1IP 4H 2ER 6BB 5K. Drew Pomeranz -LHP – MISS. 7IP 2H 0ER 4BB 10K. I think he’s the best college pitcher in the 2010 draft class. Bryan Morgado – LHP – TEN. 2.1IP 6H 6ER 2BB 3K. He’s been disappointing following his stellar Cape showing last summer. Alex Panteliodis – LHP – FLA. 5.1IP 8H 5ER 1BB 3K. Logan Darnell – LHP – KY. 6IP 7H 4ER 2BB 3K. Anthony Ranaudo – RHP – LSU. 6IP 5H 3ER 3BB 8K. (W, 2-0) His arm strength appears to be back as he threw 99 pitches. Blake Cooper – RHP – SCAR. 9IP 4H 0ER 1BB 10K. (W, 7-0) 12 groundball outs and 10 K’s. That leaves just 4 fly ball outs in a huge win against Drew Pomeranz and Ole Miss. Justin Grimm – RHP – UGA. 5.1 IP 12H 8ER 4BB 4K. Loss moves to ace of a very disappointing Georgia team to 2-5. Nick Tepesch – RHP – MIZZU. 7IP 4H 2ER 2BB 8K. Barret Loux – RHP – TEX A&M. 7IP 5H 3ER 3BB 8K. T.J. Walz – RHP – KAN. 4.1 IP 9H 7ER 2BB 3K. Chance Ruffin – RHP – TEX. 2IP 5H 2ER 2BB 4K. Rare bad outing for Ruffin leads to Jungmann’s ND. John Stilson – RHP – TEX A&M. 2.2IP 1H 0ER 2BB 5K. Gerrit Cole – RHP – UCLA. 5IP 8H 5ER 4BB 5K. 24 BB in his last 23 innings. Seth Blair – RHP – ASU. 6.2IOP 7H 3ER 1BB 7K. Greg Peavey – RHP – OSU. 6.1IP 10K 4Er 0BB 4K. Brett Mooneyham – LHP – STAN. 4.2IP 4H 6ER 6BB 3K. Chris Sale – LHP – FGC. 7IP 11H 8ER 2BB 11K. Not showing the dominance I would expect from an elite pitcher in a non-elite conference. Jordan Cooper – RHP – Wichita St. 8IP 9H 2ER 2BB 4K. (L, 4-2). Strong in his 2nd straight complete game. Cody Wheeler – LHP – Coastal Carolina. 9IP 5H 2ER 2BB 7K. (W, 6-0) Coastal moves to 30-5 with this win. Kevin Munson – RHP – James Madison. 2.1 IP 0H 0ER 1BB 3K. (W, 5-0).